In Golden section - Pentagon - Dodecahedron I have explained how a regular dodecahedron can be constructed starting from a cube and what relation exists between the edge of this dodecahedron and the edge of the given cube. 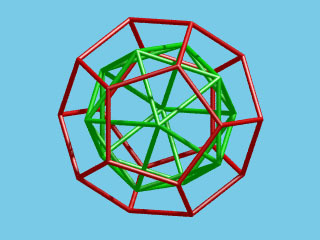 The ratio edge of the dodecahedron / edge of the cube is the inverse of the golden number Phi. If we consider also a second cube, "circumscribing" the dodecahedron the ratio of the edge of the dodecahedron and the edge of this second cube is the inverse of the square of Phi. Although Euclid (book XIII proposition 16) constructs a regular icosahedron starting with a given sphere, there's a nice method to construct a regular icosahedron starting from a given cube. We want six of the edges of the icosahedron to be positioned in the faces of the given cube as indicated on the first drawing. The twelve vertices of the icosahedron must be the endpoints of this line segments (second drawing)! We should derive the length of the edges as a function of the length of the edges of the given cube, or even better, their proportion (third drawing). The so-called Book XIV of the "Elements"
It is known that the so-called books XIV and XV of the "Elements" are not by Euclid. Book XIV is the work of Hypsicles, who probably lived in the second half of the second century B.C. This book deals with the comparison of different regular polyhedra. The same circle circumscribes both the pentagon of the dodecahedron and the triangle of the icosahedron inscribed in the same sphere. From this proposition it follows that the dodecahedron an isosahedron inscribed in the same sphere also share their inscribed sphere. As a consequence we obtain the following nice property of those polyhedra: the ratio of their volumes is the same as the ratio of their surfaces. The dodecahedron and icosahedron as "Dual Polyhedra"
The centers of the faces of a regular dodecahedron are the vertices of a regular icosahedron and the centers of the faces of a regular icosahedron are the vertices of a regular dodecahedron. 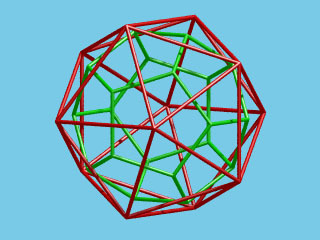 Both regular polyhedra are "dual polyhedra". Last update: November 17, 2007.